Elle's Studio Kit & a giveaway! I was so happy to get my hands on this August 2013 Limited Edition Kit from Elle's Studio. I have seen her products in stores and admired them on fellow scrapper's layouts and projects and now I had some of my own. Elle's Studio is owned and operated by Elle herself. She opened her business in 2007. 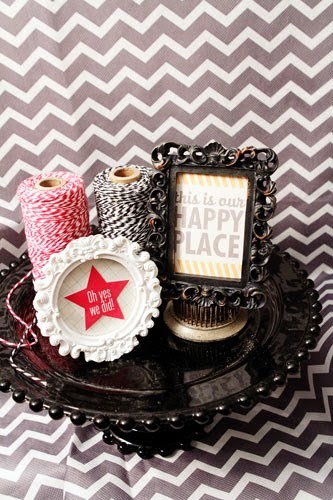 Elle's Studio "specializes in journaling and embellishment tags-our goal is to make journaling fun!" All products in Elle's store are also made here in the USA. You can see more about Elle's products on her company website and her blog! Elle's Studio also has a message board and a gallery to visit to connect with others! Every Thursday there is a new sketch for those who like a challenge! Elle has and has had some great designers on her DT that are bound to inspire! Let's take a look at this August Limited Edition kit. Ease of use: Well right off that bat I can tell you that the items from this kit are extremely easy to use. They are all cut and ready to apply to a page or project. There was only one piece that required you to cut them apart if you so choose. If you are doing Project Life many of these pieces are the right size to just slip into your pages. That's wonderful for those who like to have items that are ready to go! Usefulness: While all the items in this kit are paper products I will have to say the thickness and weight were perfect! Not too thick and or flimsy. Very easy to manipulate and cut. The colors and graphics are very nice! Everything was only printed on one side. Not a big deal but for those doing PL double sided is kind of nice. Fun wording and phrases as well. A well coordinated kit! What I liked: I love the colors, the graphics, and that the product is ready to use and pre-cut! I love how they are coordinated but not all the same print! I like the variety of shapes and sizes of the elements. I love that you get a great combination of items to add to your project without feeling overwhelmed by the product! What I didn't like: Maybe the price unless you can get it on launch! I used some of the 6x4 tags and cut them to fit into the mini frames. Then I added one of the diecuts (star) to that. I love that the cards can be used for PL but can also be altered for other uses! Overall I think this line of product is just adorable and really offers some cute ways to incorporate your journaling into your project. I loved the colors and graphics. Very fun and happy! Two thumbs up for Elle's Studio August 2013 Limited Edition Kit! What do you think? Have you tried any of Elle's products or kits? What are your thoughts? We would love to hear from you! Leave a comment by midnight EST on Tuesday to be entered to win a prize pack from Elle's Studio! U.S. residents only and be sure to leave a way to contact you if you win! I have always loved Elle's Studio and love the new kits too. I don't do project life so I wonder if they would be beneficial? I love Elle's Studio products!! Never tried a kit, but the products are super fun. Used some on a layout last night even. I haven't really seen any Elle's Studio products before, but I love to journal and love products that make it easy and fun! Thanks so much for sharing about this company and for the chance to give them a try! I've got one sheet of Elle's product and would love to try some more! I agree with you on the price! I've purchased Elle's products in the past and have always liked them. I love Elle's Studio tags! I have used some of their tags on my regular layouts and I love them! I have a limited supply of Elle's products due to the same issue you mentioned in your review. What I do have...I love. So much, I find it hard to "use" them...like I'm hoarding them for "just the right" time..LOL!! Haven't tried any of Elle's Studio products yet, but look like they would be great to use with Project Life. Love Elle's Studio! their journaling cards rock! Super cute and fun! I've admired Elle's Studio at my LSS, but haven't added them to my collection yet. I'd love to win this set. Thanks for the review. Love the elle's tags and journaling cards. the colors are great! would love them! Oh, I just love elle's studio! The clean contemporary styles look like so much fun. I have only seen elle's products on line. Really like the design style and would so enjoy the opportunity to try some of the products. Looks like a fun set of tags and cards. 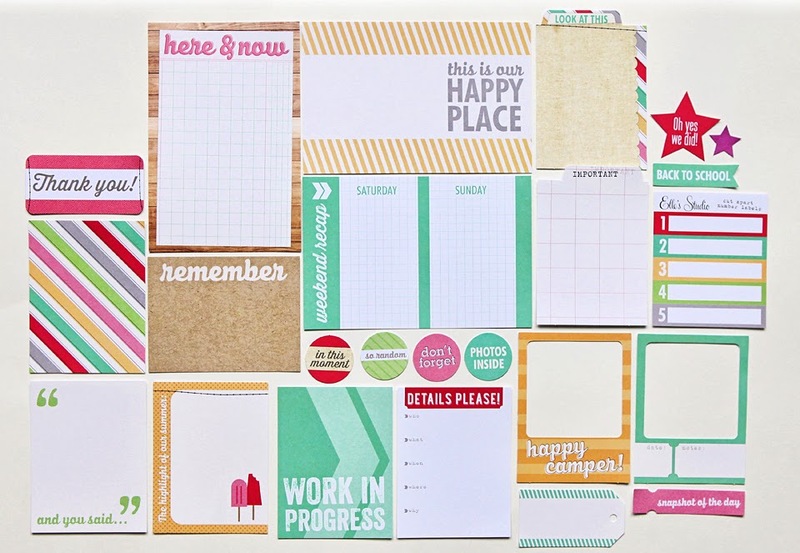 I don't do any kind of pocket scrapbooking at the moment, but it looks like these bits and pieces would be great for regular layouts. I don't think I've ever used any of Elle's products. These are cute! I love the colors of this collection! Yes, I've used Elle's products many times in my PL. Love these mini frames you put together, awesome! I haven't used Elle's Studio products. But, I think this kit looks really cute, I love the colors. I haven't tried any of these products before, but they look cute and fun! I love the colors and the graphics! How fun! Love what you created! Sorry . . . didn't answer the question . . . I have tried their products! They're fabulous! I have used several of her products. I just love her journaling tags!